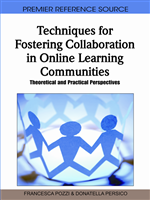 The aim of this study is to examine means of fostering videoconference-based collaborative learning, by focussing on three issues: (1) to induce collaborative learners to write a co-construct, applying (in addition to their shared knowledge) their unshared knowledge, which tends to be neglected, according to the social-psychological research paradigm of information pooling; (2) to activate these learners in their dialogues to exchange unshared knowledge possessed by one learning partner, so that it becomes shared knowledge possessed by both partners (knowledge transfer); (3) to try out, as an instructional support measure, scripted, content-specific visualisation, combining a content scheme with an interaction script. An experiment was conducted with 30 learning dyads, divided into three conditions of videoconference-based learning with application sharing: without instructional support, with content-specific visualisation, and with scripted content-specific visualisation. As expected, the scripted content-specific visualisation led to a higher transfer of previously unshared knowledge to shared knowledge. But, contrary to expectation, the scripted content-specific visualisation did not induce the learning partners to apply more unshared knowledge in writing their co-construct. Instead, in all three experimental conditions, learners brought significantly more shared knowledge into the co-construct than would have been expected from the distribution of shared and unshared knowledge measured before collaboration. People who are involved in collaborative settings often have the task of building knowledge by collaboratively writing a text on some subject matter (Scardamalia & Bereiter, 2006; Weinberger, Stegmann, & Fischer, 2007). In the context of learning, the desired learning outcomes of such a task are twofold (Cress, 2008): The learners should acquire knowledge (individual learning outcome), and the group should produce a high-quality external artefact (collaborative learning outcome). Concerning the collaborative learning outcome, it is crucial that the learners contribute as much as possible of their task-specific prior knowledge to the process of discussing and creating their joint product. In this respect, the social effect of information pooling (Stasser & Titus, 1985) suggests that learners prefer to contribute knowledge which they all own (shared knowledge), and neglect knowledge that is only owned by one or a few of them (unshared knowledge). Concerning the individual learning outcome, a significant aspect is to what extent learners enrich their existing knowledge by acquiring knowledge from each other. This means that learners adopt previously unshared knowledge from others, and in this way make it shared knowledge (interpersonal knowledge transfer). In the present study, an instructional support measure was applied to foster these processes. The support measure was designed to encourage learning dyads to introduce both shared and unshared knowledge into their collaborative problem solving process. To investigate the effect of information pooling and the transfer of knowledge in collaborative learning, the study is based on a quantitative methodology as applied by Jeong and Chi (1999, 2007). Knowledge was measured in a propositional way, and shared knowledge was taken for granted if the learning partners possessed knowledge on the very same concept.